DK: What kind of client was Michael? What was it like working with him? TM: He was a very delightful client to work with. He was very cooperative, he listened, he was very respectful of me, and attorney Susan Yu and our staff. The worst thing I can say about him is that sometimes he was inaccessible. Sometimes he was difficult to find, and I think part of it was he was so terrified and fearful of this process, but he was a delightful person to work with. DK: I imagine that would be horrifying having people saying these kind of things about you. How did he handle all of the stress that came with that? TM: I think it was very difficult for him. You know, I used to talk to him often, early in the morning because my schedule was that I would get to bed, usually at 7:30, sometimes latest 8 o clock and I was up at 3, with no fail every day. Michael is a person who would often be up early in the morning and walking through Neverland to relax and get close to nature and look at the sky and the moon and stars and he would call me often at 3 or 4. He was suffering from anxiety, clearly he was at times very depressed, and he was having sleep problems. This is all normal for someone who was facing serious criminal charges like he was. DK: When I intereviewed Aphrodite Jones, she mentioned that the prosecution had called witnesses, had called friends and people that were close to Michael, and that he had a hard time with some of that, with some of what they said? TM: It was a dreadful experience. 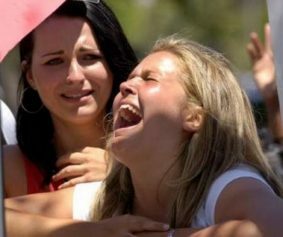 It was painful, it was horrifying, he couldn’t believe that he was listening to some of the statements that were made. He couldn’t believe anybody would accuse him of harming children. He couldn’t believe that they would ever accuse him of masterminding a conspiracy to falsely imprison a family, to abduct children, to extort. These are things that Michael was not capable of even imagining and to formally charge him with this and then to call witnesses who clearly were not telling the truth, to try and build a case against him, was frightening and very disheartening for him. DK: The trial went for over 4 months? TM: It was almost 5 months. It started Jan 31st and ended mid-June. DK: How often would you go to trial each week? TM: 5 days a week. 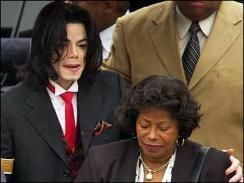 DK: When the not guilty verdicts were being read, how did Michael react? DK: Before that last day of trial, where these verdicts were going to be read, I heard that you had felt pretty certain that they would exonerate him. Was it just a feeling that you had? TM: I had a very strong feeling that this jury was not going to convict him. First of all, you have to understand California law and procedure regarding criminal trials. In California, twelve people sit as jurors in a criminal trial. California law requires a unanimous jury verdict to convict or acquit someone of a crime. This means that all twelve jurors must agree to convict one of anything. It also means that all twelve jurors must agree to acquit someone of a charge. If the jurors cannot unanimously agree to convict or acquit, the jury is set to have “hung” on that particular count. This means that the prosecutors can retry that count before an entirely different jury. Obviously, if the jury convicts a defendant of a single count, or more than one count, this is usually considered a prosecution victory. If the jury acquits on all counts, this is a defense victory. If the jury were to convict on some counts and acquit on others, it would usually be a prosecution victory. If the jury were to acquit on some counts and “hang” on others, this would be considered a defense victory. Michael Jackson was originally indicted on ten felony counts. At the end of the trial, the judge added four misdemeanor charges. For the last four felony counts against Michael, the jury had two options. 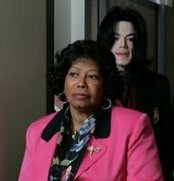 If they acquitted Michael on any of the last four felony counts, they had the option of convicting him of a misdemeanor. In other words, the jury was asked to either convict, acquit, or disagree (“hang”) on fourteen charges. 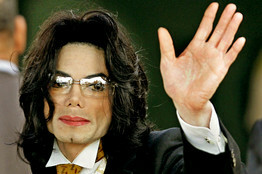 I never expected Michael Jackson to be convicted on any count, felony or misdemeanor. I believed, and still do, that he was completely innocent of these false charges. However, one never really knows what a jury will do. The jury was composed of twelve people whom I did not know. Because the trial lasted five months, I was able to observe their movements, demeanor and reactions to the testimony and evidence. I was firmly convinced that the prosecution could not get twelve people to convict him of anything. DK: What is the difference between being acquitted and being “not guilty”? TM: There is no difference between being acquitted, and being found "not guilty." Editor’s Note: To acquit, according to dictionary.com is to relieve from a charge of fault or crime, to declare not guilty. 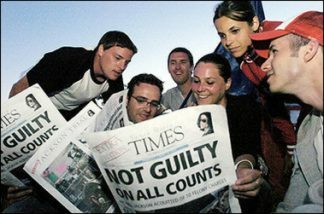 When Michael was acquitted of the charges, it means he was found not guilty by the jury. 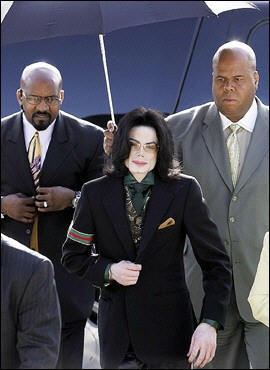 Michael was acquitted of all 14 charges, meaning he was found “not guilty” on all counts. The jury could either have convicted him on each charge, or acquitted him (found him “not guilty”). If the jury could not unanimously decide on a particular charge, the jury may be hung and they may have retried him on that particular charge. Ac.quit–verb (used with object), -quit⋅ted, -quit⋅ting. 1. to relieve from a charge of fault or crime; declare not guilty: They acquitted him of the crime. DK: Is there anything specific that you want to share about Michael, about who he was? What you would like the public to know about Michael and about the trial? 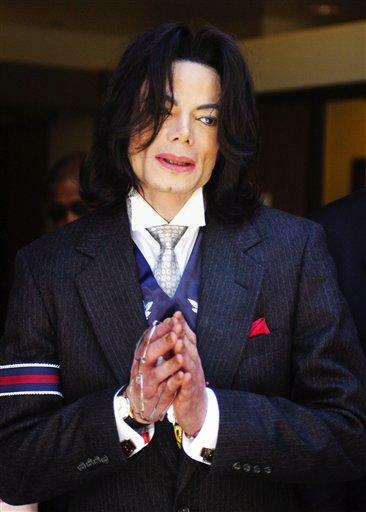 TM: Michael Jackson was one of the nicest, kindest people I’ve ever met. He really wanted to do more than just be a musical genius. He wanted to heal and change the world through love, through kindness, through art and through music and I do believe the world’s a better place because he was with us. He was very gentle, very kind. There was, I sort of describe it as a universal Michael and Michael the individual. There was the universalist Michael who wanted to change the globe. Wanted to see the entire world focus on children and he felt that if children were properly loved and cared for that we would significantly reduce the violence in the world, significantly reduce the meanness in the world, significantly reduce poverty, and all of the world’s most important problems. He felt that the way to do that was to focus on the world’s children. So that’s the universalist Michael who thought he could heal the world through music, through love, through humanitarian measures. He was one of the greatest humanitarians in world history. He actually is in the Guinness Book of Records as one of the largest donors to children’s causes, which the media doesn’t like to focus on. 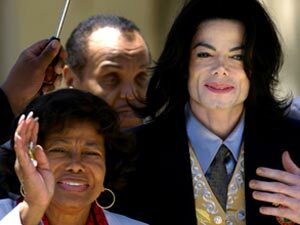 There also is the individual Michael, who I dealt with, who was a person, and he loved to see a child smile. He built Neverland to see children happy. He was one of the wealthiest men in the world. He could have spent all of that money selfishly. Instead he had a zoo, he had an amusement park, a theatre, he had statues devoted to the world’s children. If you looked at the artwork in his house, a lot of it centered on children and seeing them happy and respecting them for who they were. Their race, their religion, what part of the world they were from, what kind of native traditions they had. This was someone who as a person, loved to see a child smile. Loved to see a child from the inner city who was growing up in poverty and violence come to Neverland and look at a giraffe and smile and look at an elephant and smile. Get some free ice cream and just be happy. It just meant a lot to Michael because he was a very good person. But unfortunately when you’re that much of a genius, and you’re that wealthy, all of the sharks are going to come forward, and when you combine with that a certain level of naivety, a person who just didn’t want to be wrapped up in money matters all of the time or legal matters. He wanted to do creative things, he wanted to do humanitarian things. That makes him even more of a target for frivolous lawsuits and frivolous claims. TM: Of course, because the media wants shock value and they want to see people go down in flames and they were desperately hoping he would be convicted because it would mean stories for years about what he looked like and how he was doing in prison and was he going to kill himself. Believe me, they were salivating over his conviction and they were trying to skew all of the reporting in a way they hoped would influence the jury to convict him. Even a lot of cheap shots at me throughout that time. DK: That’s so sad that the world is like that, you know what I mean? TM: Everybody was hoping to profit off his destruction. It was terrible. 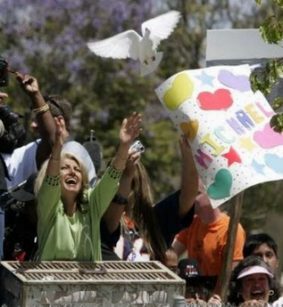 It’s one of my proudest moments in my lifetime….just acquitting him, vindicating him. In retrospect now, he only had approximately 4 more years to live, at least he was there to be with his kids and just to be vindicated. The trial was so unjust. The case was so unjust and lacking in credibility. TM: At his burial, which I attended, a young man who in the 80’s was a rather high profile case in southern California, a father doused his son with gasoline and set him on fire and burned most of his body including all of his face (this man is now known as Dave Dave, formerly David Rothenberg ). 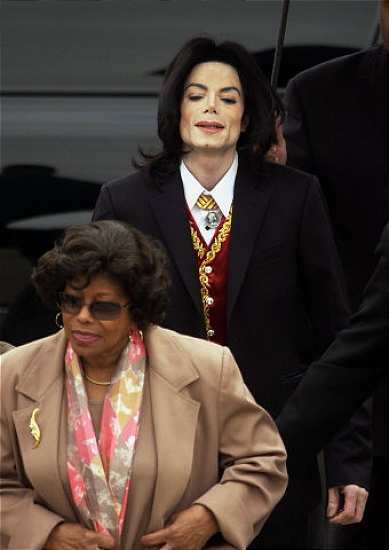 Michael took care of him. He (Dave Dave) got up to speak (at Michael's funeral) about what a kind, decent, generous, wonderful person Michael Jackson was. I happen to know there were kids all over the world he did this for. Disabled kids, children with illnesses and disabilities. Michael would write checks for them and nobody publicized it. He didn’t do it to become well known for doing it. He did it because that’s what his heart wanted him to do. You know? I think one of the cruelest things that ever happened was to take his love for children, his desire to help kids, and turn it against him and try and call him a monster as they did in that trial. It was just horrible. DK: You’re going right for what’s one of the most important things for a person and you’re turning that against them. TM: It was just heart wrenching to be there and watch him and to see it, you know, what toll it took on him. I don’t know if he ever really recovered from it emotionally. DK: I imagine that would be something very difficult to overcome. Thank you for everything you shared with me. Attorney Tom Mesereau, Jr, is highly respected in his field. Widely recognized as one of the best trial lawyers in the country, Mr. Mesereau has been selected by his peers as one of "The Best Lawyers in America" and has been listed as one of the "One Hundred Most Influential Attorneys in California" by the Los Angeles Daily Journal. These are just a couple of his accolades. 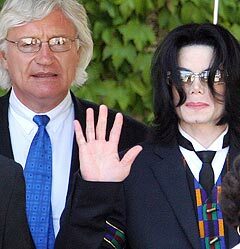 Mr. Mesereau represented Michael Jackson in his 2005 child molestation trial (he replaced attorneys Mark Geragos and Benjamin Brafman), and has very poignant insight on Michael, and the trial. "Michael is a person who would often be up early in the morning and walking through Neverland to relax and get close to nature and look at the sky and the moon and stars and he would call me often at 3 or 4 (a.m.)"
I happen to know there were kids all over the world he did this for. Disabled kids, children with illnesses and disabilities. Michael would write checks for them and nobody publicized it. He didn’t do it to become well known for doing it. He did it because that’s what his heart wanted him to do." 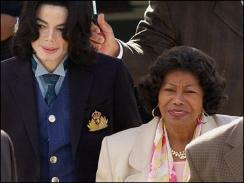 "I never expected Michael Jackson to be convicted on any count, felony or misdemeanor. I believed, and still do, that he was completely innocent of these false charges." What many do not realize is that while this trial was going on, attorney Tom Mesereau was also dealing with very real and deep personal pain. While getting ready for trial, Mesereau found out that his sister was diagnosed with terminal cancer. After being released from the hospital, she came home to find a bouquet of flowers larger than her front door with a poem tucked inside, written by Michael himself. 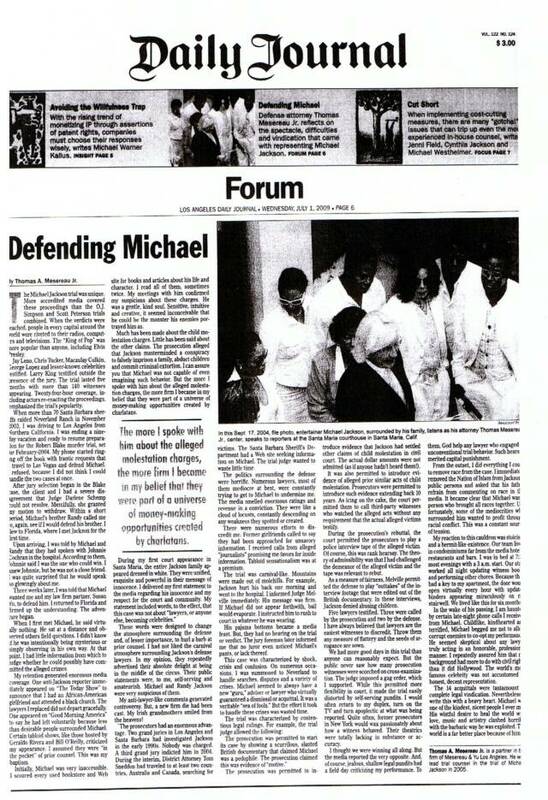 Despite his loss after his sister passed, Mesereau went forward into trial to defend Michael’s innocence. I wanted to share this story because it speaks so highly of 2 very special human beings and their character. 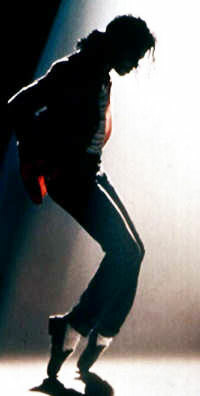 Tom Mesereau, who wholeheartedly believed in Michael’s innocence and worked diligently, even through his own personal pain and loss, to vindicate someone he knew was innocent, and Michael Jackson, despite the pain he was going through of being falsely accused of disgusting acts and of having his caring, giving nature turned against him by a family whom he had helped and who the family themselves admitted that Michael’s love and care had helped heal their son of cancer, continued to be the kind, caring, generous, sweet person that he always was, reaching out to others in their pain despite the personal pain he was going through. God definitely brought these two extraordinary individuals together. "He said the words, 'Thank You, Thank You, Thank You.' His first reaction was gratitude. Gratitude to God, gratitude to his defense team, gratitude to his family and friends." Thomas Mesereau on Larry King Live speaking of Michael Jackson's reaction after all of the "Not Guilty" verdicts were read.